Cory has lived on the streets since he was a teen. Cory has been living on the street since he was just 18-years-old. A father at a very young age, Cory tried to make a marriage work, but when it didn’t pan out, his wife left with the children and he ended up on the street. “People need to know that we are not bad people, just everyone needs help at some time. When we get work, we work our asses off,” said Cory. For the last four years, he has hitchhiked across the country. When traveling from Iowa with just the clothes on his back, Cory ended up in St. Charles without money and without any resources. That’s where he met Josh. Cory has formed a sort of family with the friends he’s met here. He took photos of his tent popped up under a bridge, at the Salvation Army eating a hot meal, and at the park cooking up dinner. 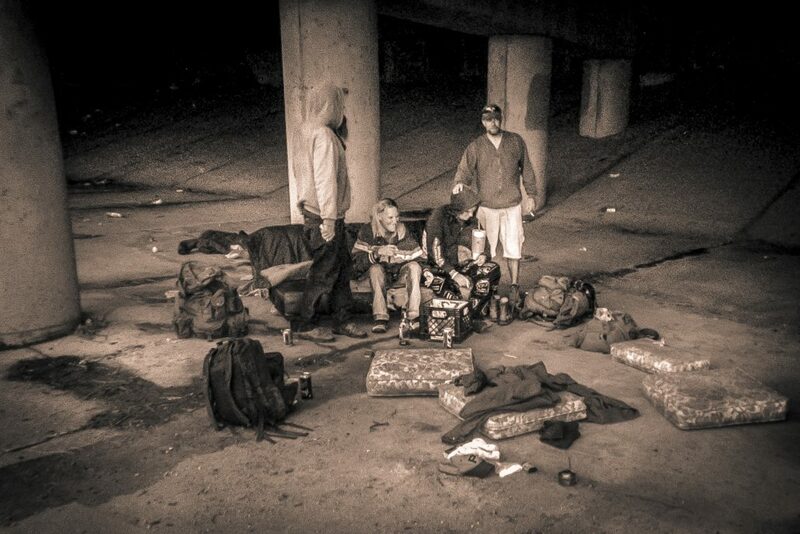 His favorite photo, however, is the one he snapped of his friends sleeping on their mattress under the bridge. “I’m the first one up every morning. It’s a very peaceful time of the day,” said Cory. To get by, Cory does odd jobs. The odd jobs don’t earn enough income to provide regular shelter or to cover costs many take for granted—like haircuts. Cory also captured a photo of his friends helping each other with haircuts. Cory hopes to see his kids in the future. He said his ex-wife took the children, moved to California, and won’t let him talk to them. “I think of them every day of my life,” said Cory.